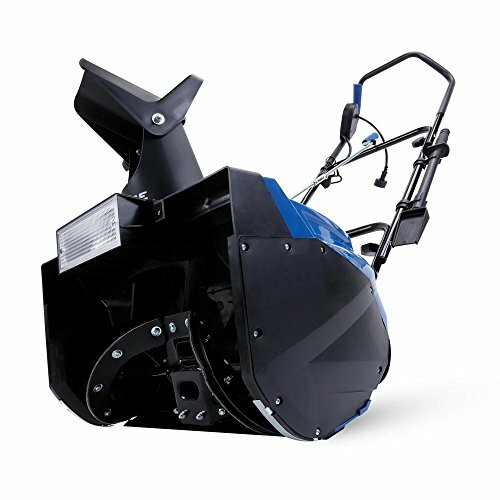 If you are looking for a middle weight snow blower to clear the driveway and the path around your house, this little number could be just the ticket. While it's obviously not as powerful as a gas powered snow blower, it also won't break the bank. It is favored by many users who repeatedly talk about how powerful it is for its size, and how surprised they are with the amount of snow it can get through. About how many inches of snow can this cut through? Does it come with a cord? I have quite a long driveway. Could I use multiple 100ft extension cords and still be left with enough power? Does this have wheels on the back like other snow blowers? Does this model run on gasoline? Does this model have metal or plastic blades, and is the outer housing made from plastic or metal? How much space does it need for storage? Will a 15amp breaker be big enough not to trip? How well does it handle heavy snow? Is there a switch to turn the light on and off? What kind of electrical plug is required? Is there a danger using an electric cord while using this product? Would the cord get wet? Is this model self propelled? This machine will easily handle dry snow up to that depth, but if the snow is wet and heavy, and that deep, you should take it real slow, or go with 2 passes. It has more power than most people expect it to have. No, there is no cord supplied. It is recommended that you use a cord of 15 amps and not longer than 100 ft. If you need to use a greater distance than that, then you need to up the amp rating of the cord. It is understood that you lose about 5 amps per 100 foot of cord. So if you wanted to work 200 ft away, you should get a cord of at least 20 amps. Also try and get one that is rated for cold use, such as this one﻿﻿﻿ , as these last much longer than a regular cord when used under these conditions. It would not be ideal for the reasons mentioned above. You may rather want to consider a cordless battery model, or a gas powered model. Another reason is that using a cord that long does become very cumbersome, not to mention irritating. You're also giving yourself a lot of extra work to unwind and wind up the cord. They get very heavy when they're that long, not to mention cold hands! Yes, it does. Two wheels at the back, black plastic. Most people have said that the wheels are of a sufficient sturdy design and are suited to their job. No, it uses an electrical power cord of 15 amps or more. The actual blades are manufactured from plastic and metal. They are of ample strength for small to medium sized clearing jobs. The outer housing is made from tough plastic, which is obviously rust free and easy to maintain. It also doesn't take up a lot of storage space. The blades are 18" in width, giving a clearing path of 18". The width of the body adds about another inch to the ovberall size. According to the manual, it will throw snow a distance of 25 feet, (this would obviously depend upon the condition of the snow), and it weighs in at 31.8 lbs. It has a foldable handle and another pivot point on the handle. It packs up very small, the shipping carton actually measures 24 inches x 20 inches x 20 inches, and you don't need tools for assembly. Many owners report having no problem with the 15 amp breaker tripping, although one person said that they had continuous problems with tripping. They later plugged it into a 20 amp outlet and had no further problems. The US Wire 12/3 blue 100' extension cord is generally recommended for this type of equipment. Most owners report that it handles many conditions just fine. As with any tool, you have to use your comon sense and not overwork it. If the snow is thick and wet, then you must work slower than if it is light and fluffy. If you live in an area where you regularly experience large snowdrifts, then a tool like this is not really for you, unless it is a secondary tool. The manual tells us it weighs 31 lb 8 oz. One 80 year old lady reports that she handles it with no problems, she purchased it because she couldn't handle a pull start, and as it is kept in her garage, and it has those wheels at the back, she has never had a reason to lift it, and is very happy with it. Yes, you can find it under a plastic cap at the back of the machine. It doesn't need a grounding prong for the plug, because it's double insulated and internally grounded like many modern power tools. There is no problem if you use a suitable cord rated for exterior use. Stricly speaking, you should also make use of a GFCI outlet while using power tools, particularly while outdoors in wet weather. No, you need to push it through the snow. Users report that it is very easy to push though. This is a very eco friendly alternative to a gas powered snow blower. It is also very lightweight. If you're not intending to move mountains of snow day after day, then this would be a good choice. You may also want to consider a cordless model that doesn't have the worry and fuss of the extension cord. Any snow blower has to beat shoveling!